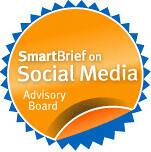 Roger Carr, Everyday Giving Blog, signed up to help me with a Bloggers Campaign part of the Sharing Foundation's Americas Giving Challenge, Today, I observed a twitter exchange from Angela to Roger. I thought she might be referring to our campaign, so thanked her. Yes, indeed Laura is helping us out. Thank you Laura! 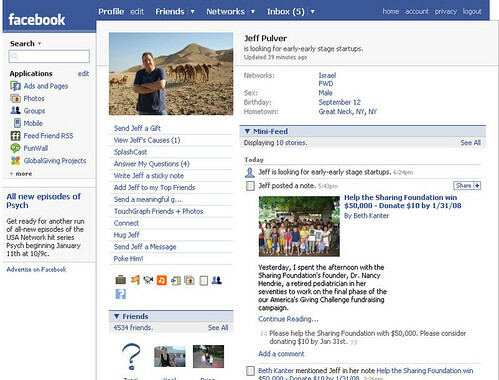 Today, Jeff Pulver, a well respected member of the social media community and legendary on Facebook reposted one of my notes about the Sharing Foundation on his Facebook profile. This will most certainly help word of our campaign reach many new people. I was so delighted that I just had take a screencapture for my photo documentation and scrap blog I'm designing on. Yep, it's working! Thanks Julia. 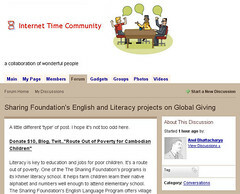 Anol Bhattacharya, repeat donor to the other socially networked campaigns I've run for Cambodia, not only donated, but made two blog posts (Soul Soup and here )and posted it to the Internet Times Ning Network created by Jay Cross. There has already been over $18,000 for the Sharing Foundation's America's Giving Challenge raised through the unselfish giving of over 650 people like Anol Bhattacharya, Laura, and Jeff. This still time to donate $10 (or more) to this important cause. Donate $10 or more by January 31st and change a child's life. Oh, wow....wait until I show her this in the morning. Thanks Beth! I hope she sends you a few donations. We'll be making ours too--good luck! I continue to meet tremendous people online who I probably wouldn't have met otherwise. This fundraising challenge has reinforced for me how powerful social networking can be. I have loved supporting you and the Sharing Foundation in this contest. I will continue to do what I can to get the Foundation that $50,000 prize to add to the donated funds.